Wage the Battle is a call to action. It is the amazing story of how self-described manufacturing guy Paul Nehlen took on Speaker of the House Paul Ryan in one of the most closely followed congressional races in the nation. Nehlen’s run presaged the international movement against globalism which reached its climax with the election of President Donald Trump. It’s a firsthand look at the development of one of the original Trump Republicans and the populist message which is sending shockwaves through the Beltway Right. 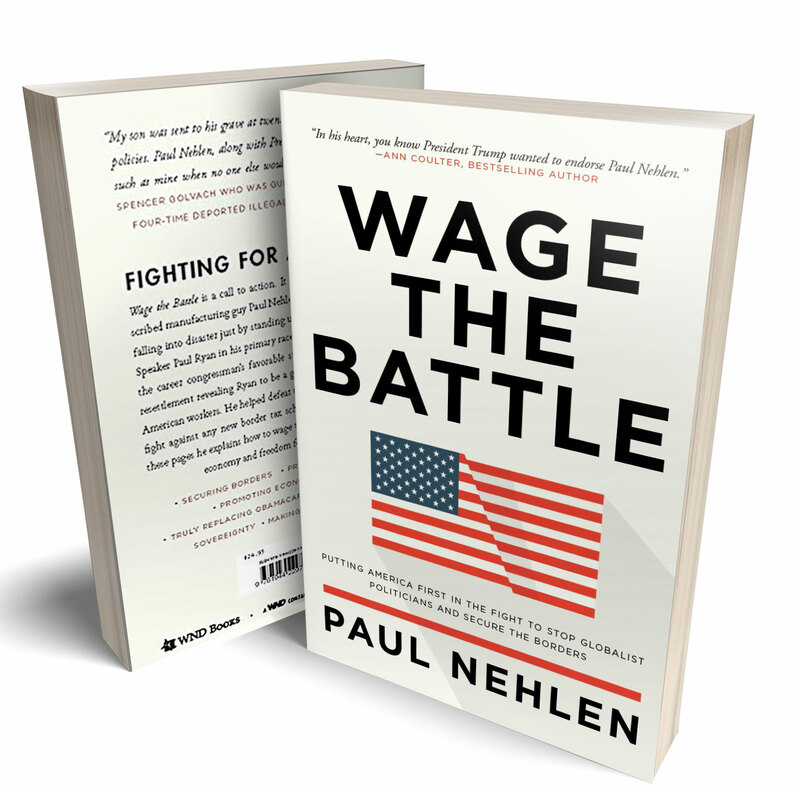 In Wage the Battle, Paul Nehlen takes you inside his quixotic campaign and shows how this David vs. Goliath political struggle inspired patriotic activists around the nation. He also tells the story of how his primary challenge, though unsuccessful, ultimately helped beat the Trans Pacific Partnership (TPP), the international trade deal once described by Hillary Clinton as the gold standard for trade and a policy goal for both the Republican and Democrat Establishments. Nehlen shows why the populist, nationalist struggle and the Trump administration will center on trade and provides the invaluable perspective of an international businessman who came to champion America First. He also throws down the gauntlet at the feet of Paul Ryan, accusing the Speaker of being a corporate crony career politician who is selling out his constituents. Wage the Battle, also exposes the need for enforcing not reforming existing immigration laws and Paul Ryan s support for open borders. Mexican cartels flood their wares across the border. Coyotajes smuggle people across the border. Yet bureaucrats in Washington claim the border is secure. House Speaker Paul Ryan even teamed up with liberal Illinois congressman Luis Gutierrez to push amnesty. The attitude of the UN and immigrants first has led to the ill-named refugee resettlement program, in which predominantly Muslim refugees are settled into unsuspecting communities. The battle lines of globalism versus nationalism are drawn. In Wage the Battle you see how one man can stop a major global initiative in TPP. Now it’s time to continue to fight for our communities, for our laws, for our culture, for our way of life. Wage the Battle offers resources and advice for getting involved at a grassroots level. You could be the next lightning rod of good in your community if you put your mind to it. America is unique. She is worth fighting for. Let s keep waging the battle.